Artist in Residence @ L'Artishe: Reward Yourself With A Great Night Out! It has been a very strange day, the weather has had more multiple personalities than Sybil. If you are a child of the eighties you will know what I am talking about. That being said it has been a bit quiet. But the best news that I have had today is nothing to do with the gallery. My friend Alex got under my VW camper van and within half an hour he succeeded where many others had failed. He got Sheldon going and now I am full of optimism. That's two of my vehicles fixed in one week. I will be camping in comfort in a few weeks time. I am hoping that tomorrow will bring some much needed sunshine as the rainy weather makes Swanage really quiet. 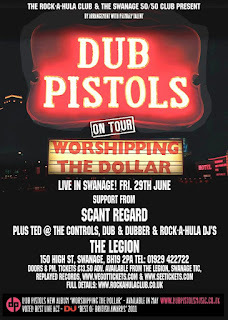 I don't know obviously if music is your thing but tonight The Dub Pistols are playing in Swanage and it is a very rare thing to have a band this big playing somewhere so small but perfectly formed. I think there are still some tickets left, at Replayed Records and for those of you willing to pay a little more it's £15 on the door. I'm going and you should too. It is the weekend and I hope that you have got something good planned.